I had been here in Sumedang for almost three years. I made some new friends and new stories. But Pariaman, the town of Tabuik, was the town where the part of my life began. Pariaman was a serene town near the ocean where most of the people there had a blood or family relation whether to my father or mother. It was interesting because wherever I went to every corner of this town, I would find someone who was related to me by blood or family-bonded. There was nothing bizarre in this town. Every day in the morning the atmosphere was quite chilly as if the town was moved onto Mt. Singgalang and after that, the sun shone very intense in the afternoon yet the weather was very balmy, then in the dusk, I could see violet and crimson colors dancing on the sky, it was very beautiful. For the most people around, my town had something that was really famous – its beach. This town had three beaches; Gandoriah, Cermin, and Kata – in a row from the most crowded to the desolated one. Gandoriah Beach was the most well-known beach in Pariaman. It was the pride of the town because of its longshore, clear light grey sand where you could find many white corals and shells scattered along the line, and blue sea with massive waves smacked repeatedly the coastline gave me the best view for enjoying the most gorgeous sunset in my entire life. Gandoriah was the queen of our town’s tour destination. The reason why it was so famous because people were always coming to see the traditional dance and singing performances from the school students and local artists every Saturday. But, it was very crowded most of the time. It was also near the town market so, if I got bored after school, I would go there and then continued to the beach. There was a time when I met some female foreign tourists wandering near the way to my house, asking some men in a modest coffee shop about the beach, I thought they might be some backpackers that just came to this town for the first time. Those men were struggling to understand what those three girls said and then confused because they were not able to speak English, so I approached them asking if I could help them. They were surprised and asked me whether I could speak English or not. I reassured them that I understood also was able to speak English. I could see the feeling of relief on their faces and then, they started to ask me for information about Tour de Singkarak and some places to stay. I gave some suggestion about hotels or inns that I knew but they seemed not really welcomed to hear the suggestion that I offered. So I asked the men in the shop about cheap places to stay and trying to be a translator for those American tourists who actually looked for a place to stay around Gandoriah Beach. I helped and found them a ride to go to an inn that was close to the beach. If I was not mistaken, it happened days before Tour de Singkarak was held. Tour de Singkarak was an annual men’s bicycle race which the track passed through almost all of the streets in West Sumatera, including Pariaman. This sports event was also the reason why Gandoriah became famous. The tour passed along the coastline, I still remembered there were many Indonesian flags and banners which said ‘Welcome to the Gandoriah Beach’ or ‘Pariaman Rancak’, or something across the town included the street near the beach. My high school required all of the students to contributed to the event by attending it as a supporter, thus as a student, I must come along to support the event. The teachers would bring us to the sideline of the track road waiting for the athletes appeared. Actually even without us, the students, attending that event, it always successfully brought the town became a crowded place. The people came out from their house and went to the beach to see the athletes or would be just gone to the other spot near the track road. In one moment of Tour de Singkarak was held, if I was not mistaken, I was in my junior year of middle school, we stood on the sidewalk. We were very bored of waiting the athletes came so, we sat along the sidewalk. We were not only the students who came to support the athletes because there were also Engineering High School students who gathered near our crowd. They were very famous for being high school delinquents in our town. It seemed like they were also ordered by their school principals to attend the event. While in the moment of silence, suddenly those school delinquents were cheering and shouting out of the blue. So without thinking whatsoever, all of us in the area began to cheer and shout along with them. In the moment of our confusion, we realized that it was only a cart passed by, not the athletes with their bicycle. I still remembered the smug face of the driver when he passed through the street with our cheering, those boys laughed really hard after we fell for their little prank. I found that moment was very hilarious. A couple minutes after their prank, the sport event participants approached and dashed through our standing place followed by some people in cars waving their hands to us and those boys kept booing towards the cars, what I believed, for no reason. We were waving some small national flags and cheering every athlete that passed by, I remembered the smiles and the laughs every year Tour de Singkarak coming across our town, whether men or women, adults or children, they came along to see the tour. The Gandoriah which was not always that crowded but also very loud with people gathering around sometimes. 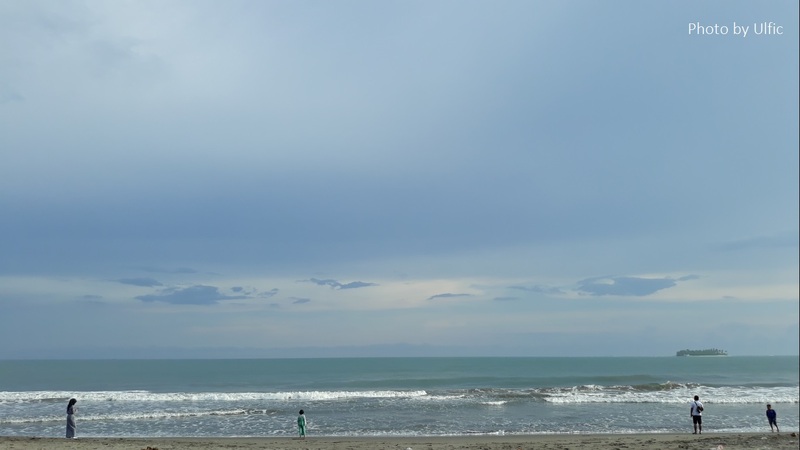 There was a time I really missed the moment when I went to the Gandoriah Beach alone after school because I had no intention to come home early. It was so calming and the beach was so quiet. There were only a few people took a stroll so I walked along the serene shore enjoying the white noise of waves approaching the beach. The sound of the pine trees around the beach that was rustling to the wind. The feeling when the sun shot his ray straight to my face, along with a clear bright view as if I could see the fine line that separated between the sky and the sea. I missed when I breathed the smell of the ocean, I could taste the salt of the breeze from the sea. I stayed there until the sky went crimson and the sun dipped to the sea as a huge orange drowned. It was such a peaceful atmosphere as if I was the only person at the moment. However, I always missed Gandoriah every time I was far away from home, the place where the people came around. I would close my eyes and imagine as if I was there, that I was not going anywhere.